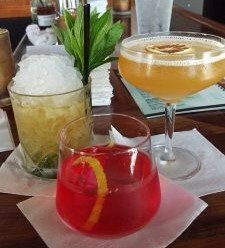 Ann Arbor has a vibrant craft cocktail scene and on this tour you’ll have a chance to explore it with an industry insider and cocktail expert. Cocktails wouldn’t exist without spirits, so our tour begins at Ann Arbor Distilling Company, which makes artisan products from Michigan ingredients. You’ll spend some time learning about distillation and sampling their products in the tasting room before venturing on to explore two of Ann Arbor’s best bars. During our short walks through the city’s Old West Side, Downtown and Kerrytown neighborhoods you’ll learn some Ann Arbor history. In the bars, your guide will help you navigate the menus and explain as much or as little as you’d like about the ingredients and techniques that go into your glass. Your ticket includes spirit and cocktail samples totaling about 1 drink. Additional beverages and food are available for purchase as desired at the stops.